description: The rhizome is erect. Stipes are rusty at ground level and green on the upper portions. 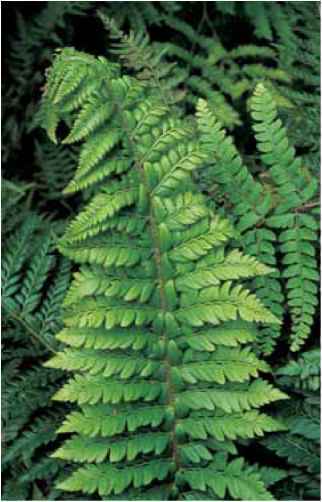 The length relative to the total frond is variable. Entire, rich green, arching blades have a heart-shaped base and are narrow with an extended tapering rooting tip. Sori with one-sided indusia point outwards like an upside down V.
Camptosorus rhizophyllus walks along the surface of a limestone outcrop in Massachusetts. 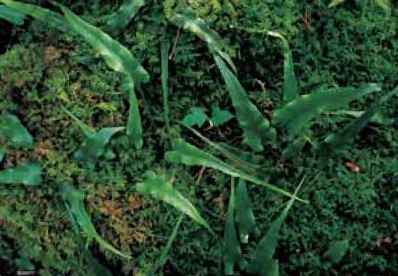 range and habitat: The walking fern meanders about, rooting along the way, in moist to wet deep shade on moss-covered limestone rocks or occasionally on shale or sandstone. It spreads from the upper midwestern to eastern North America down to Tennessee, West Virginia, and northern Alabama, and is one of the most easily recognized of the East Coast natives. culture and comments: This very unusual species is cultivated with difficulty because of the ever-present threat from slugs and snails. My plant was on a limestone rock, in a container high up on a table, and still it disappeared. The slugs apparently dropped out of the trees. Truly a conversation piece, this fern is not totally impossible. East Coast experts seem to have better luck with it.